Available in the UK from Pack Your Bags with free postage. [EDIT] Available from Amazon UK too! 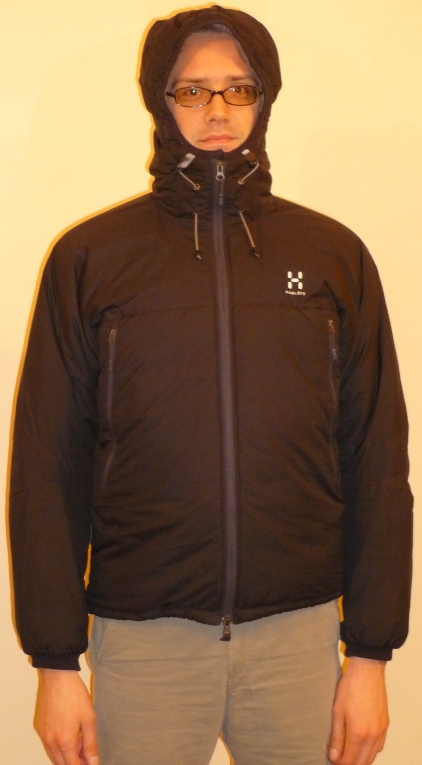 I thought I’d give my thoughts on the Haglofs Barrier Hood jacket as I’ve recently had several people express interest in it. I’ve owned mine for over two years now so feel I can give a fair summary of its good and bad points. I was looking for a lightweight packable insulated jacket for winter, to put on over everything when I stopped for lunch on top of a mountain. I wanted synthetic rather than down as I already had an Alpkit down jacket, which, while being very effective at keeping me warm, wasn’t going to get worn when there was the possibility of rain. 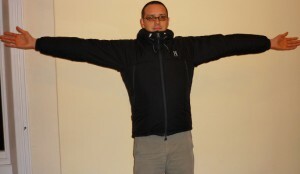 Being tall and slim with disproportionately long arms I’ve struggled to find much upper body wear in the UK that fits. Luckily, it appears I am a similar shape to the Swedish. Being 6’2″ with a 40″ chest the medium fits me well, even over a base layer, a fleece and my Rab Baltoro Guide softshell. I’m not sure how much difference there is between the sizes but I feel no need to go up a size. I would be interested to try a large but I don’t usually use it over that many layers. My main concern was finding an insulated jacket with long enough arms and these are spot on! 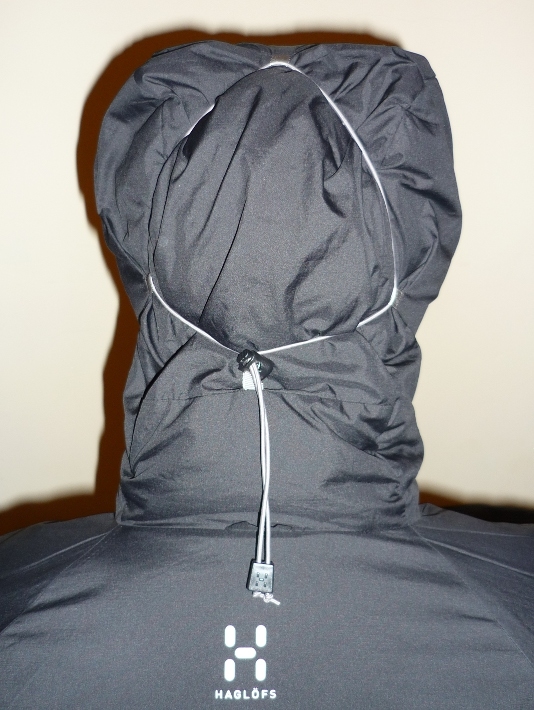 The hood is adjustable for volume using an innovative elasticated system and the usual drawstring (also elasticated) tightens up the opening of the hood. I understand the volume adjustment enables it to fit over a helmet but I’m not a climber so have not tried this. It seem reasonable enough though, considering how voluminous the hood goes when the adjustment is fully loosened. The other advantage of this is that you can leave as much of your face out of the hood as you choose which also means it turns with you. Considering various other well known outdoor brands have been criticised for substandard manufacturing in the last few years, this seems absolutely bulletproof (not literally…). A couple of months after I bought it, I wore it to the pub in winter and was told I fell into a rather prickly hedge upon leaving. On the left shoulder it got all scraped and caused a little damage. This has got no worse in two years of very regular wear and did not affect the performance of the DWR (Durable Water Repellent coating) at all. That said, the jacket does start to wet through with some loss of insulation after about ten minutes of heavy rain now. Bare in mind I’ve not washed this or reproofed the jacket at all in this time. Shameful, I know… According to the care label, it can actually be washed using normal laundry detergent rather than needing TechWash or similar, like DWR-coated jackets normally do. I have not tested this however. Using a warm tumble-dryer after washing is supposed to reinvigorate the DWR. I may well test this soon. For a jacket that feels so thin it really is astoundingly warm. It’s not noticeably lost any warmth over time either, though I imagine it has simply due to being used. 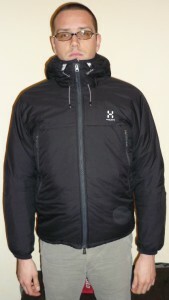 Considering I now use this as my winter jacket for day to day use, it still looks like new. It could do with a wash, but even the Haglofs logo hasn’t rubbed or come away at the edges. 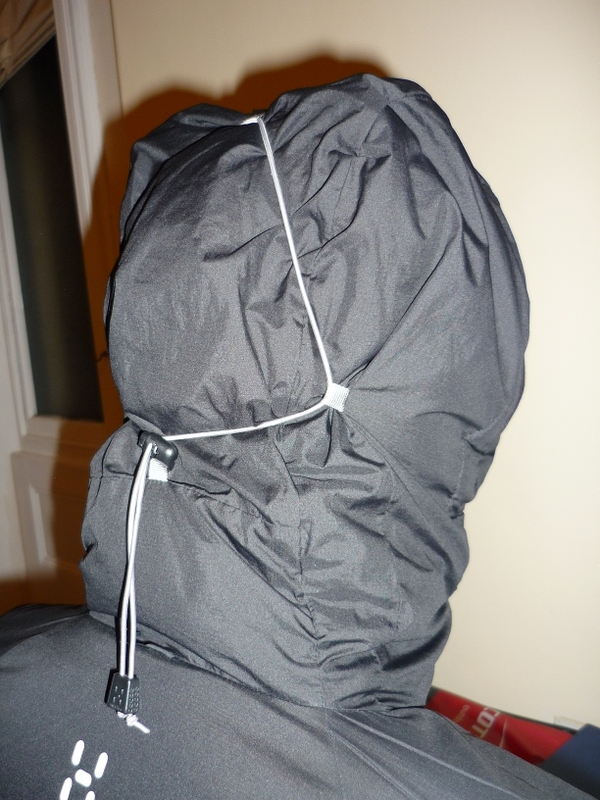 Considering the shell material is polyester rather than nylon (like Pertex) I see no difference in wind-resistance. It’s very plain looking too, so it wouldn’t look out of place over a suit. My ONLY bugbear with this jacket is sometimes the zip is a little difficult to start. I have also experienced this on a Haglofs fleece so it may be one of their idiosyncrasies. It really is a minor issue though, and I’ve not heard anyone else mention this so I may have just been unfortunate. 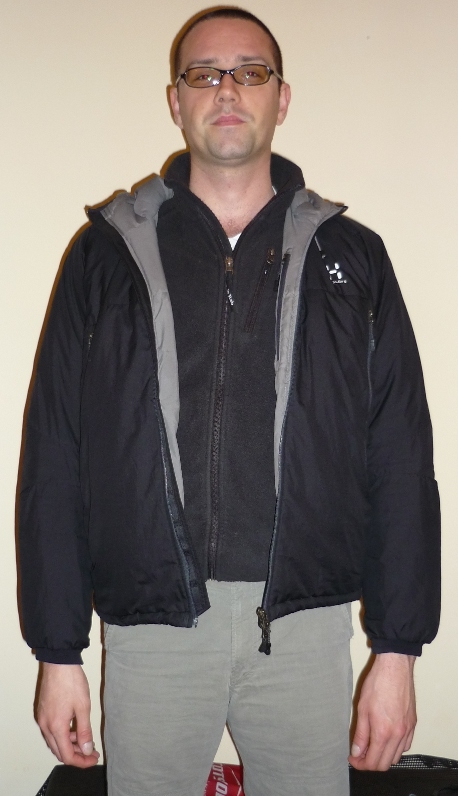 It took me some time to decide on which insulated jacket to buy as they were all quite expensive. Considering I have not just used this for hillwalking, I would not hesitate to buy another if this ever got damaged. I only hope they don’t stop making this otherwise I’m going to have to buy five. I have not regretted this purchase at all. As I mentioned earlier, I got mine from Pack Your Bags with free postage. I only found one place cheaper but the postage costs actually made it more expensive. They were also very helpful in answering my questions on arm length. I have the Barrier Jacket and the zip is a little tricky to get it initially hitched. 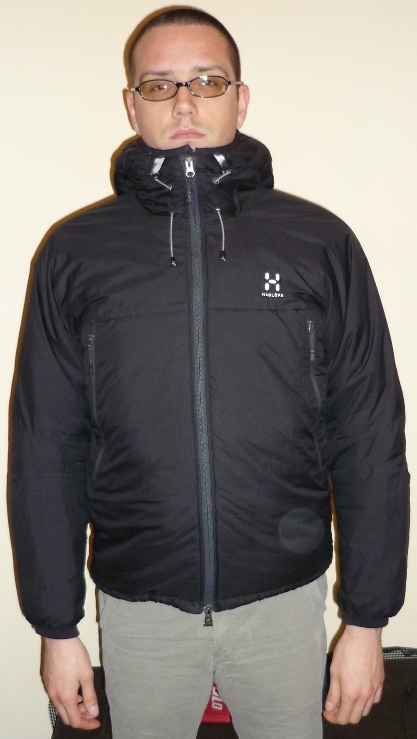 Bar the above the jacket is superb and it feels as warm as any primaloft equivilent in weight. I have been tempted for the hooded version but how much can one spend on gear? I think it’d be great as an insulation layer on a mountain esp taken on a killimanjaro expedition. I’m a bit of a hood fan tbh. It’s been a LONG time since I’ve bought anything without. I know some people prefer a hat or having their head clear but to me it’s a hat you can’t lose, plus it seals off any wind around the neck!